A Coming Home Feast – Voila! We’re back!!! And I don’t just mean the blog. James and I have been on the go in Denver, St. Paul and D.C. these past two weeks covering the Democratic and Republican National Conventions. I went to Denver and returned to D.C. to work the night shifts during the RNC. With James out of town and myself working evenings, dinners were simple. But James gets home tonight and in celebration of all our hard work, it’s time to celebrate with a feast! So what’s on the menu? A marinated flank steak with blue cheese, kasha varnishkes and a salad. For dessert? 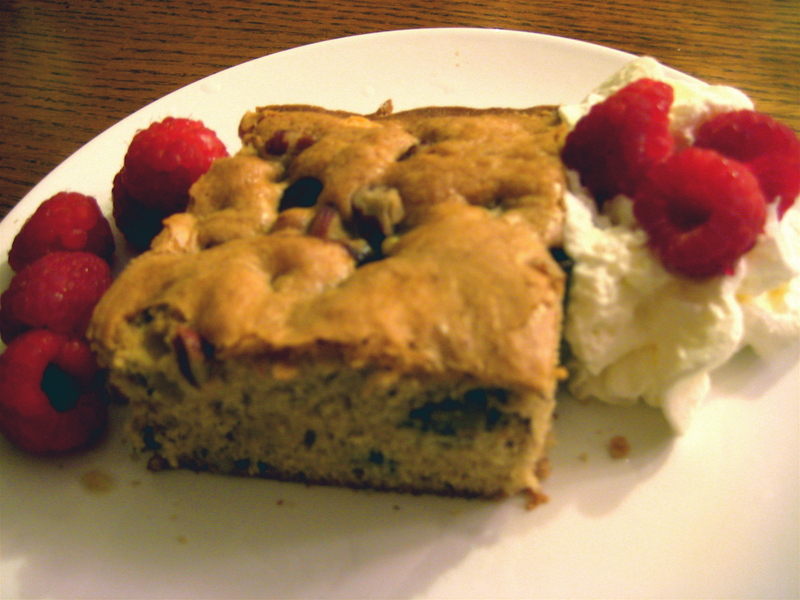 Blondie brownies with whipped cream and raspberries. Before we get going, you may be rereading that last paragraph…kasha-what? Kasha: KAH-sha. A kind of grain that was eaten in Eastern Europe and often associated with traditional Jewish meals. Kasha is often used in matzo ball soup or a filling for knishes. Varnishkes: Var-nish-kees. The addition of bowtie pasta and veggies (i.e. onions, mushrooms and celery) to the kasha. It’s a savory side dish that goes well with chicken or beef, not necessarily fish. It’s a heavier grain and wouldn’t blend with the lighter taste of fish. I associate kasha with cozy home cooking and tradition. We always had a box of kasha around the house, but it only appeared every once in a while — Shabbat, Rosh Hashana or usual family dinners. And when it did, the house, the dinner, everything felt a little more special. I even remember the usual pot my mom served it in. She always used a short but wide cream colored, flowery pot with a matching lid and a silver serving spoon. It’s a funny thought that one simple side dish can, or at least I like to think, connect you with a history of tradition. 1. Heat skillet to medium heat, sautee all veggies and set aside. 2. Boil water and cook bow tie pasta. 3. Lightly whip egg white in small bowl. Add kasha and mix well until well coated with egg white. 5. Once kasha is done, add veggies, bowtie pasta and stir well. 2. On each side of the steak sprinkle with salt and pepper. 3. Place steak in ziploc bag and add all ingredients. Try to push most of the air out of the bag, lock it up, then mix the ingredients so steak is covered. Refrigerate and let it marinate for at least an hour and up to overnight. 4. Remove meat from the bag and shake off excess marinade. 5. If you broil: set broil to 350 and broil on each side for around 4 minutes, or until it’s cooked the way you like. Take it out and slice away! Preheat oven to 350. Grease glass baking dish. 1. Combine flour, salt, baking powder and baking soda. 2. In a large sauce pan melt butter over low-medium heat. Once melted, remove from heat, add sugar and whisk together. 3. Add eggs and vanilla, stir. 4. Add flour in thirds, stirring well after each addition. 5. Add dark/white chocolate chips and stir. Add pecans and stir. 6. Pour batter into greased baking dish. Sprinkle some dark/white chocolate chips and pecans on top. 7. Bake for 15-20 minute, until golden brown on top and a check with a knife comes out clean. Post-baking thoughts: Since I associate a cozy, warm meal like this to my home growing up, I felt it was time to create the same feeling of home, warmth and love in my own apartment with my own family. The brownies: I doubled the recipe for this (we’re going to a few BBQ’s this weekend) and put it all in one big lasagna pan. As a result, it become more cakey than brownie. However, it was still delicious! Next time, even if I do double the recipe, I would still suggest cooking it in two separate batches. Pingback: Matzo Ball Soup « Voila! and was continued in 2010 by her son Prince William. the men. As technology and greener ideas merge together we as consumers seek to benefit. and money, benefit the environment and look chic all at the same time.